These are just a handful of innovative environmental projects that 120 middle school students from 12 schools representing the Northeast, Mid-Atlantic and Florida will present during the 21st annual Wheelabrator Symposium for Environment and Education. The Symposium will take place May 4-7 at the Sheraton Columbia Town Center Hotel, 10207 Wincopin Circle in Columbia, Maryland under a theme of "Working Together to build Sustainable Communities." 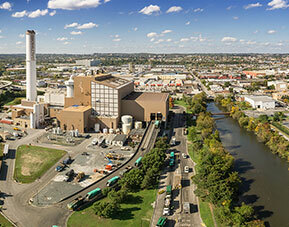 This will be the first time Wheelabrator Technologies Inc. will host its environmental conference in Maryland as its Baltimore-based renewable energy-from-waste facility celebrates its 30th anniversary. An industry leader in converting post-recycled waste and other renewable fuels into clean energy, Wheelabrator’s commitment to sustainability extends to environmental awareness, education and community engagement. “For 21 years, the Symposium has played a major role in Wheelabrator’s corporate social responsibility program and, in that time, has empowered more than 3,000 students to become environmental stewards in their local communities. The Symposium enriches all those who participate and creates experiences that students remember for a lifetime,” Weidman added. The Symposium is based on Wheelabrator’s belief that environmental awareness must be grounded in fundamental science, and that businesses and communities should help educators introduce real-life experiences to young adults. Working with their teachers and Wheelabrator employee-volunteers, the Wheelabrator Symposium challenges middle school students to identify an environmental issue in their community at the start of the school year and then research, develop and implement a long-term solution. It incorporates STEM (science, technology, engineering and math) concepts and provides students with an interdisciplinary view of environmental issues and solutions. On Tuesday, May 5, student teams will present their solutions to a panel of educators and environmental experts. The VIP panel will include Dr. Bryan Kent Wallace, Director of Physics Labs at Fisk University in Nashville; Dr. Merilyn Johnson, STEM Supervisor and Curriculum Science Specialist for Broward County Public Schools in Florida; and Casey Shaw of the Elizabeth River Project in Portsmouth, Virginia. Live-stream viewing of student presentations will be made available at Wheelabrator’s website, enabling classmates, teachers, school and town administrators, family and friends to watch as each project is presented. The day will culminate with an awards dinner, featuring Baltimore’s Mayor, the Honorable Stephanie Rawlings-Blake, as the keynote speaker. The awards dinner will also feature guest environmental speaker David Mizejewski from the Natural Wildlife Federation. Then, on Wednesday, May 6, the student teams will participate in a Green Expo, which is similar to a science fair. During the expo, students will showcase their projects and engage with other teams to share ideas and sustainability best practices. Later in the day, students will visit the National Museum of Natural History in Washington, D.C.
Headquartered in Hampton, New Hampshire, Wheelabrator creates clean, renewable energy from everyday residential and business waste. Wheelabrator has a current platform of 15 energy-from-waste facilities, four independent power-producing facilities, four ash monofills and three waste transfer stations. Wheelabrator has an annual waste processing capacity of over 7.4 million tons, and a total combined electric generating capacity of 768 megawatts — enough energy to power more than 645,000 homes. Wheelabrator facilities also recover metals from ash for recycling into commercial products. For more on Wheelabrator: www.wtienergy.com.